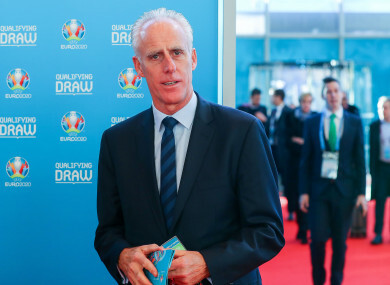 Mick McCarthy pictured at today's Euro 2020 draw. IRELAND BOSS MICK McCarthy has admitted that “everyone is slightly relieved,” after his team avoided being drawn in the archetypal ‘Group of Death’ at today’s Euro 2020 draw. Gasps in the audience indicated that some believed Ireland were set to be placed in the same group as footballing heavyweights Germany and the Netherlands during today’s event in Dublin, as they were initially drawn with the formidable pair in Group C.
However, Uefa rules state that no more than two host countries can compete in the same group, so Ireland were instead put into Group D alongside Denmark and Switzerland instead. “I don’t know if you were in there, or saw it, but all of us who had not been drawn thought we were going to get with Holland and Germany, and there was a sigh of relief [when they were avoided] — not from me, I laughed,” McCarthy said. “I’m thinking about when we qualified for the World Cup [in 2002], we had Portugal and Holland and everyone had written us off for that, and we didn’t lose against any of them. “So whichever group we are in, we are going to have to take it. But I think everyone is slightly relieved. “But I think that is a bit premature when you have Switzerland in the group, who are one of the best teams in Europe at the minute. On some people’s initial assumption that Ireland would be facing Netherlands and Germany, the 59-year-old coach added:”Everybody who was still in that pot were thinking they were going to be in that group and you heard the reaction to it. “It’s like the old cliché ‘Group of Death,’ everybody thought. I laughed because I was fully expecting to be in that group — being sod’s law, you think you will get it. And then, because it’s in Dublin, somebody will be thinking there was some skullduggery going on somewhere. I don’t know why, it was like someone with their magic fingers on the laptop shifted us to a collective sigh of relief. Ireland have been pitted with some familiar foes in Group D. Apart from Switzerland, they have faced every other team in their group in at least one of the last two qualification campaigns. The Swiss, meanwhile, were the last team McCarthy played in his first spell as Ireland manager, with his reign ending amid a disappointing 2-1 loss in Dublin, which seriously hampered the team’s hopes of qualifying for Euro 2004. The former Wolves and Sunderland boss is wary too of a Georgian team that Ireland have faced on numerous occasions in recent years — in the Martin O’Neill era alone, the sides met four times competitively, with the Republic winning three and drawing one. “I know that we have played them recently and I was chatting to [former Ireland international] Kevin Kilbane and he said what a good side they were,” McCarthy added. “I think that was probably one of the toughest ones in Pot 4, but then we missed Azerbaijan and we ended up with Gibraltar. “I know Georgia is a fair old trip. I believe there is a three-hour time difference, so that always makes it unusual conditions to play, and it’s not easy if you have to travel great distances. McCarthy also feels a winnable match to start the campaign would be ideal, with the Boys in Green set to play their first qualifier in March. Do you want a game, any game, that you think that maybe you can win? And if that is the case, everyone will be looking at the last team, Gibraltar. “But what if you go there and it is on a plastic pitch? Who knows? “I’d like a full house there. I’d love it to be a big game. Email “I laughed when Ireland were paired with Netherlands and Germany - McCarthy”. Feedback on “I laughed when Ireland were paired with Netherlands and Germany - McCarthy”.